Pictured: The MD Class of 2022 moments before their White Coat Ceremony began. Deborah Manog Dimaya photo. Jay Anderson’s eyes grew wet, and he began to choke up when asked what he was feeling moments before his daughter, Clare-Marie, was presented a short, white coat in a ceremony marking her official entry into the University of Hawaii (UH) medical school. He grew emotional because he was thinking of all the other people — as he put it, the “village” — who helped support his daughter and his family in getting Clare-Marie to this point. 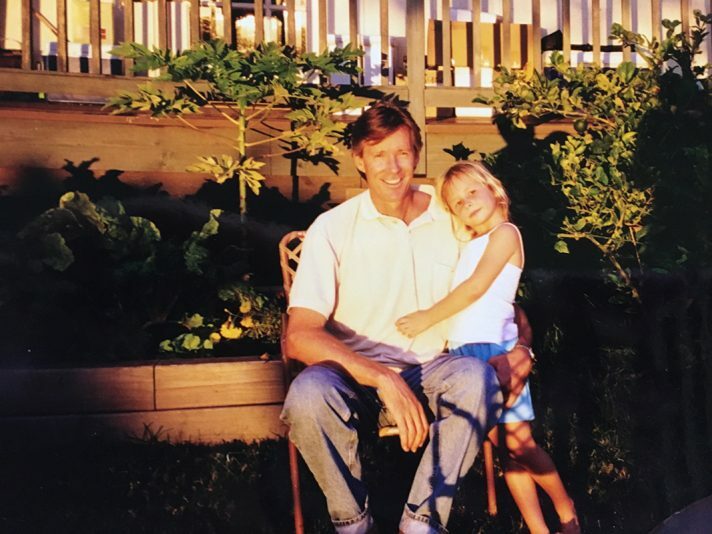 Jay Anderson with his daughter when she was a little girl. “It takes a lot. It takes the community and a village to get kids through school these days,” said Anderson, who explained that his family had to move from rural Molokai Island to Oahu so that Clare-Marie could attend a well-regarded private school to prepare for medical school. Clare-Marie remembers the painful day, in fourth grade, when with a quivering voice and damp cheeks, she asked her parents if the family could move to urban Oahu. It wasn’t a decision made lightly. She loved Molokai. 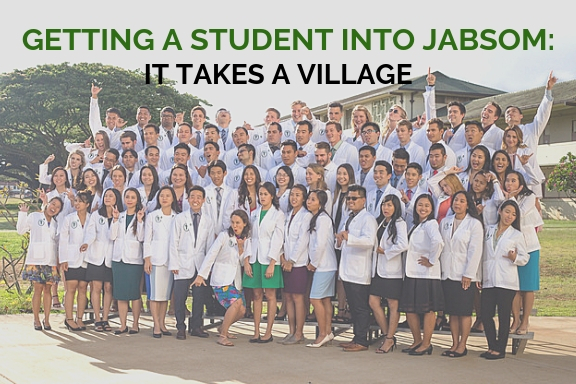 “My dream of becoming a doctor is rooted in the red dirt of a Hawaiian island small enough to be mistaken for a speck of dust on a world map,” she wrote in her entrance application to JABSOM, which she gave us permission to share here. But even at the tender age of 10, Clare-Marie had questions elementary school couldn’t answer. She burned to know more about science and biology. “My heart danced with the discovery that my new school would have progressive laboratory facilities complete with compound microscopes for genetic experimentations, and chemicals of every color- resources a small-town girl once thought unimaginable,” Clare-Marie wrote. “As I grew older, my awe of the human body flourished in anatomy and biology lessons”. While in college, Clare-Marie developed a passionate desire to become a physician. Her father takes pride in remembering how hard she worked at UH Manoa, especially given she became a student-athlete, playing on the Wahine volleyball team. 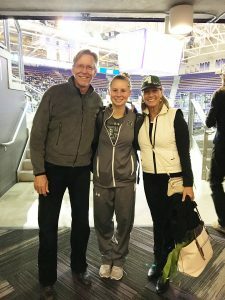 She earned high enough scores not only to get into the John A. Burns School of Medicine, but to be awarded a full, four-year merit scholarship. Clare-Marie Anderson with her parents after a UH volleyball match. Clare-Marie’s village has encompassed the people, primary school teachers and health providers of Molokai, educators at private school, parents willing to sacrifice anything for a gifted child, professors at UH Manoa, academic medicine mentors at JABSOM and those who believe that scholarships are an investment in the future that pays an immeasurable dividend. Jester Galiza was 6,000 miles away from his native Hawaii when he realized that as a future physician, the community he needed to serve would be his own. Born and raised in Ewa Beach, Galiza was valedictorian of his class at Campbell High School. He was attending Dartmouth College in New Hampshire, already a trained Emergency Medical Technician, studying pre-med. He volunteered for an 11-week trip to Peru to work with a health services organization. That is when his transformative moment happened. “The physician that was working in that clinic was from that community. Another physician was there who wasn’t from that community. And I saw the difference. When I was working with the doctor who was from that community, the barriers (between the doctor and the patient) were completely eliminated. The trust was there. I think it was at that moment, that salient moment, where I recognized there is so much power in going back to your community and serving in partnership with that community. And that definitely was a huge moment for me in recognizing my desire to go back to Hawaii and serve my community,” said Galiza. “There is so much power in going back to your community and serving in partnership with that community,” said Jester Galiza, MD 2022 Class President. Jester is MD 2022 Class President. He is a natural leader full of confidence with terrific sense of humor. From very early in grade school he wanted to be a teacher. In sixth grade, however, he encountered a teacher, Mr. Oshiro, who encouraged him to consider additional options including medicine, law or engineering. Mr. Oshiro continued to mentor Galiza as he prepared for high school. “He was tough on me and challenged me like no other teacher did. He told me I was destined for great things. He was one of my biggest motivators. He told me, ‘You’re going to be valedictorian, you’re going to participate in athletics, you’re going to be class president, he was just listing all these things, and then he said you are going to go to an Ivy League school when you graduate,’ and I thought to myself, what is an Ivy League school?” Galiza chuckles. But Galiza took all the science and health occupation courses he could. He sought out the honors and Advanced Placement courses Oshiro recommended. And he ended up checking all the boxes: becoming class president, valedictorian and enrolling in Dartmouth College. “That was where I really experienced academic failure for the first time and realized I was behind,” he said. He felt unprepared to understand science the way most other pre-med students in his class seemed to have learned it, beyond just memorization. Galiza (R) with his parents and siblings. “Undergrad is when I started feeling doubt,” Galiza said. Still, he remained an above-average student at Dartmouth. When asked what continued to fuel him during those difficult periods, he said it was gratitude. Before Galiza applied to medical school, he wanted to make sure his first dream, to be a teacher, was out of his system. 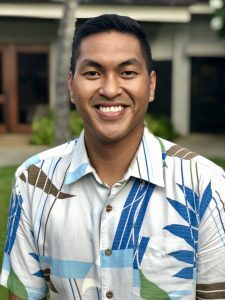 He joined Teach for America, obtained a Master’s of Education in Secondary Math from the University of Hawaii, and both taught math and spent several years leading other teachers in the organization on Hawaii Island. When he applied to JABSOM, he was waitlisted. He ended up applying for the Imi Hoola Post-Baccalaureate Program, the intensive one-year JABSOM preparatory program which prepares college graduates from underserved backgrounds for medical school.